The vast number of trails that form the highway system in the Himalaya connecting villages to trade routes and bringing much needed food and other necessities to the hardy dwellers of the region provide a number of fantastic opportunities for mountain biking. In Nepal take day trips to explore the areas around Kathmandu or take multi-day trips combining on and off road pedaling or expedition style trips that take you deep into the heart of the Himalaya for rewarding experiences that provide an exposé into the culture and traditions of this singularly mountainous country. In Tibet explore the area around Lhasa with us on two wheels and pedal power on day trips. 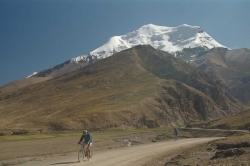 For the more experienced riders we offer the opportunity to cycling out from Lhasa to Kathmandu a total of 990 km through the heart of the Himalayan range and between two of the most celebrated cities. In India we’ll journey with you to the fabled tea gardens of the hill station of Darjeeling on a trip that begins in sub-tropical forests in the foothills and wends its way up to Darjeeling at 6500 ft. in a combination of on and off road multi day ride.